One of the things that struck me, re-reading these chapters set in Rivendell, is how close, what intimate friends Frodo and Bilbo actually are. I had forgotten. 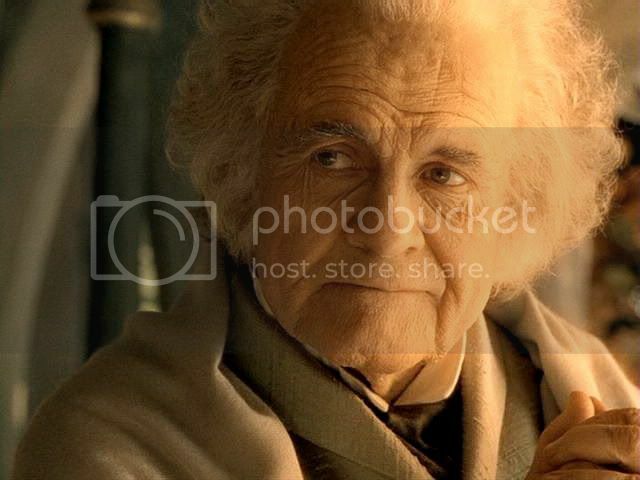 In part, it is because of the book itself: Bilbo isn’t there that much, literally, in the pages of The Lord of the Rings—an inevitability, perhaps, because he doesn’t go on the Quest. 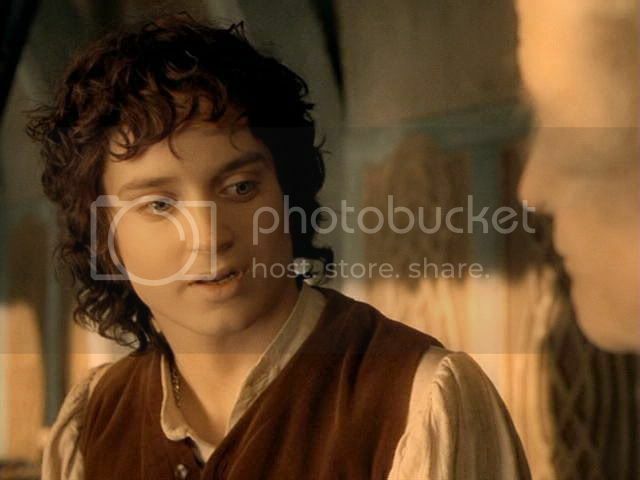 But I think my amnesia also comes from reading a lot of fanfiction that portrays Frodo in intense love relationships. Whether the author imagines Frodo involved with Sam or Merry or some other person from the Quest, or with an original character back in the Shire, these stories necessarily make Frodo’s relationship with Bilbo a side interest. It is this way in real life for most of us: when we fall in love with someone, our existing relationships with family or friends tend to take a back seat, at least for a while. The Rivendell chapters reveal a relationship that is close and unique. 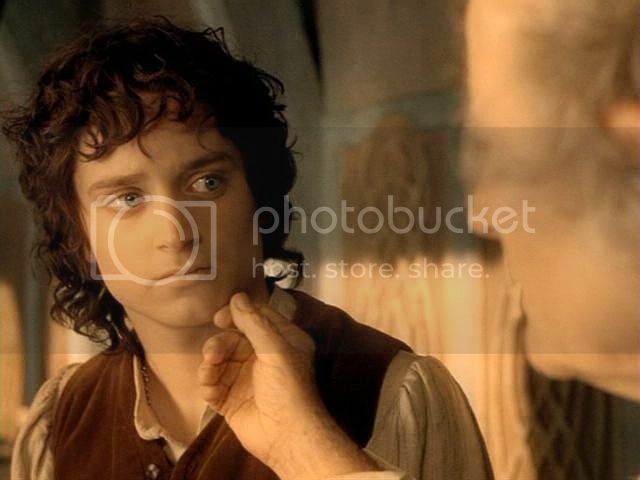 Bilbo and Frodo are not depicted as a loving parent and child, or even a devoted mentor and student, but as intimate friends, of long standing, who hold each other very dear. 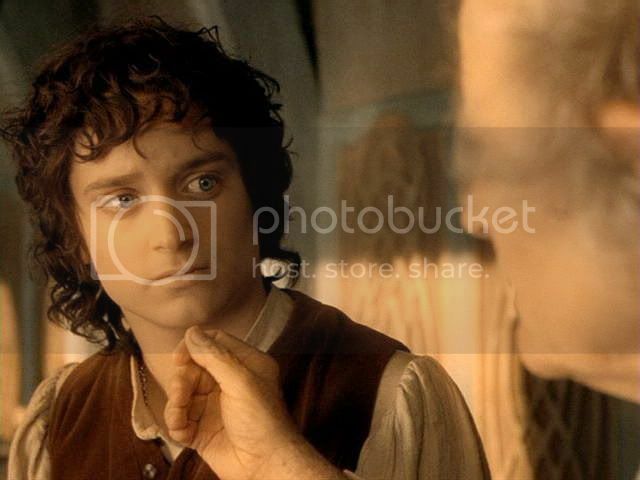 Even the power of the Ring cannot tarnish their mutual regard. In the book, it is on Frodo’s first day out of bed, in the Hall of Fire, that the shadow of the Ring falls between them. Bilbo asks to see the Ring and suddenly, to Frodo's shock and dismay, he sees Bilbo as a grasping, withered, frightening old creature. (The specific book excerpt and more discussion will be provided when I get to that film scene.) 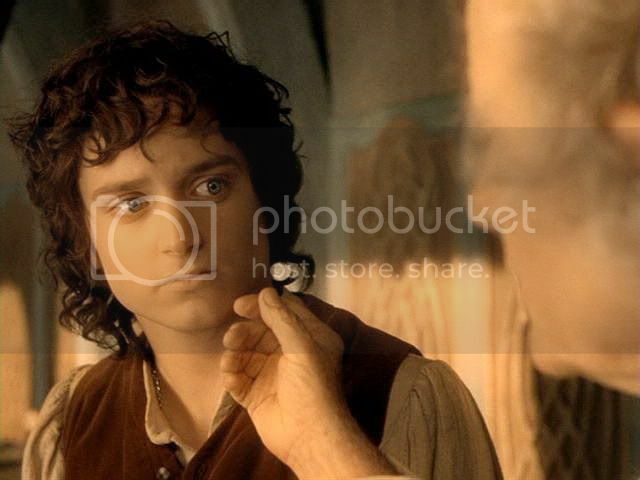 Bilbo understands that the power of the Ring has overshadowed them. He makes a brief acknowledgement, pulls himself together, and moves the conversation in another direction. In that way they are able to let it go, and they do, spending the ensuing months delighting in each other’s company. That’s how strong their love is, and how comfortable they are with each other. The two cousins may be widely separated in age and very different in temperament, but they have much in common, and not only ties of blood and a shared past. They share knowledge, interests and enthusiasms, perhaps even a their aesthetic sense. Perhaps the most important thing they have in common is their exceptional honesty and decency. This is difficult to find in one person, much less two. This post also features the third poem in jan-u-wine’s “Rivendell Suite”, written specifically for this scene. 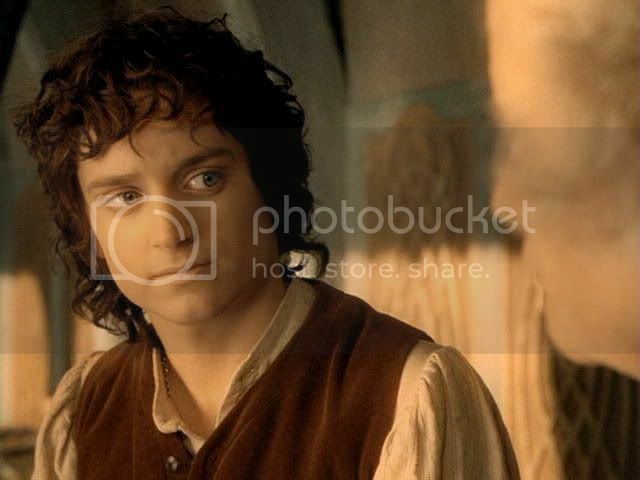 Whether Frodo is out on the gallery with Bilbo in the sunlight-hours, or in the archives of Imladris at night, jan-u-wine takes up the particular bitter-sweetness, even melancholy of the film scene and develops it with the depth of her book-lover’s perspective. 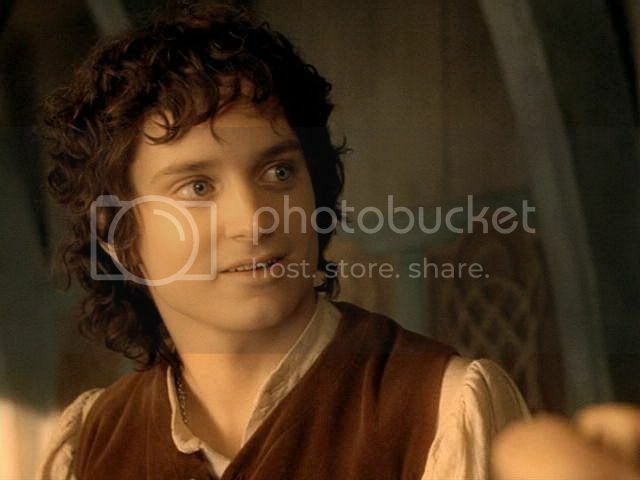 The Frodo Baggins I know and love resonates in every word. When I have finished reading, a savour of him lingers in my heart and mind, the way a fine wine echoes on the palate. The scene below continues immediately from the excerpt in the previous entry, in which Bilbo recited his song of Eärendil to the company. As the attention shifts elsewhere, Bilbo makes a proposal. They got up and withdrew quietly into the shadows, and made for the doors. Sam they left behind, fast asleep still with a smile on his face. In spite of his delight in Bilbo’s company Frodo felt a tug of regret as they passed out of the Hall of Fire. Even as they stepped over the threshold a single clear voice rose in song. The Elves sing ‘A Elbereth Gilthoniel’. 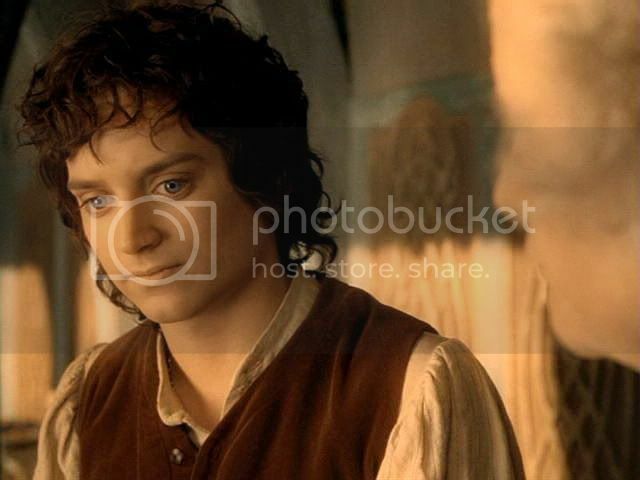 He led Frodo back to his own little room. It opened on to the gardens and looked south across the ravine of the Bruinen. There they sat for some while, looking through the window at the bright stars above the steep-climbing woods, and talking softly. They spoke no more of the small news of the Shire far away, nor of the dark shadows and perils that encompassed them, but of the fair things they had seen in the world together, of the Elves, of the stars, of trees, and the gentle fall of the bright year in the woods. The brief excerpts below comes from later in the story, after the naming of the Fellowship at the Council of Elrond. I include them here because I think they give a good overview of how the hobbits spent their time during their autumn in Rivendell. In those last days the hobbits sat together in the evening in the Hall of Fire, and there among many tales they heard told in full the lay of Beren and Lúthien and the winning of the Great Jewel; but in the day, while Merry and Pippin were out and about, Frodo and Sam were to be found with Bilbo in his own small room. 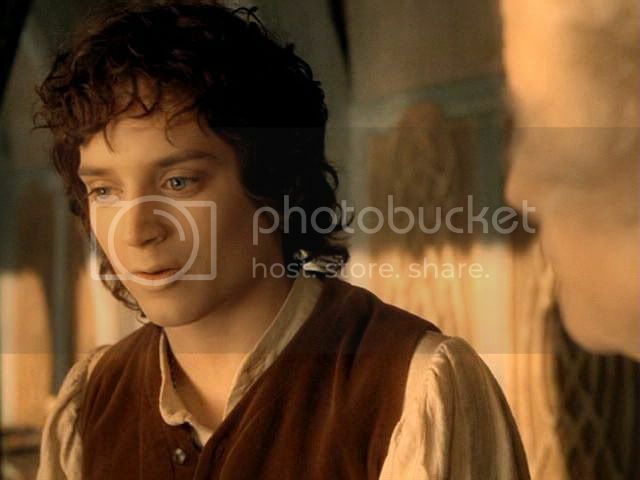 Then Bilbo would read passages from his book (which still seemed very incomplete), or scraps of his verses, or would take notes of Frodo’s adventures. So the days slipped away, as each morning dawned bright and fair, and each evening followed cool and clear. Frodo: But my own adventure turned out to be quite different. 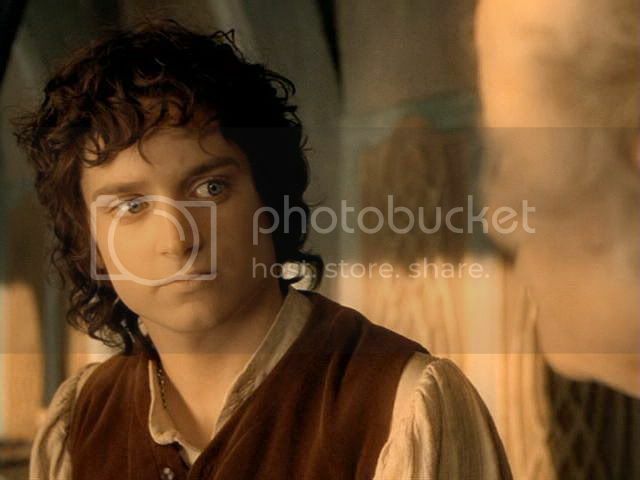 Bilbo listens, then Frodo looks at Bilbo. 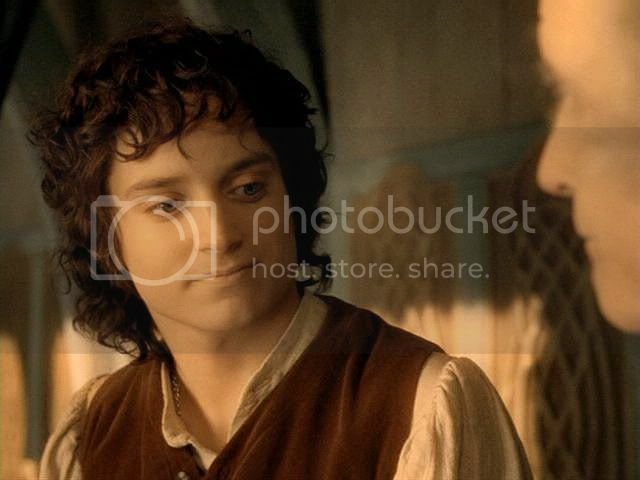 Frodo: I’m not like you, Bilbo. (as he said I might). long vanished from mortal eyes. my heart should ne'er understand. I'm not like you, Bilbo. I am not like you at all. 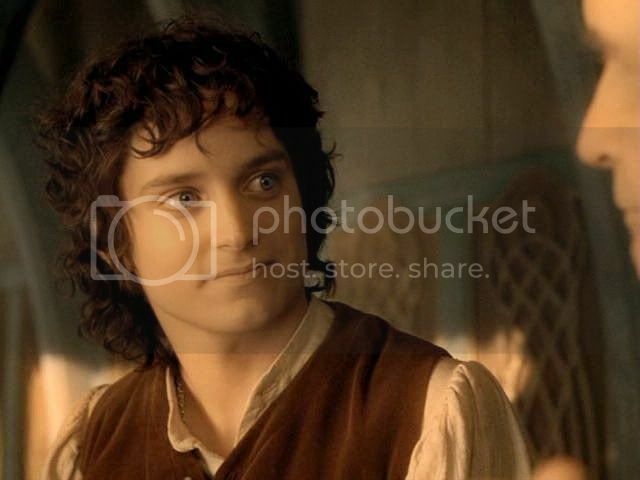 Screencap lovers should know that the talented Blossom has capped these first Bilbo-Frodo scenes to create an animated gif and slideshow (with music and bits of dialogue), plus a gallery of selected caps. If you don’t know Blossom’s work, you are in for a treat. Her caps are all from the widescreen version, and are beautifully, expressively tweaked. Each one is a work of art. To show the difference, here is her version of one of the caps above. It’s gorgeous. If you would like to see her slideshows and caps for this scene, go to her Frodo website, In Dreams. Go to the slideshow called “My Dear Boy”. The animated gif and the gallery of caps are accessed with links provided. You won’t be disappointed! ~ Riv. 4 – Red Book: ‘This is wonderful!’, plus Pt. 2 of jan-u-wine’s ‘Rivendell Suite’. ~ Riv. 6 – ‘Ready to go home’, plus jan-u-wine's "Soon". ~ All entries with jan-u-wine's poems. Oh my, how beautiful it all is. Your commentary, the pictures, and the exquisite poem. So much of my "Quarantined" series of stories was meant to capture the evolving and very special relationship between these two very special hobbits. They spoke no more of the small news of the Shire far away, nor of the dark shadows and perils that encompassed them, but of the fair things they had seen in the world together, of the Elves, of the stars, of trees, and the gentle fall of the bright year in the woods. Shirebound, I know you are extremely fond of Bilbo as a character, so I am not surprised to hear his relationship with Frodo has inspired you to write. And I love the quote you singled out. Yes, they shared a lot. That they could share delight in these things must have created a kinship in them that was soul-deep. 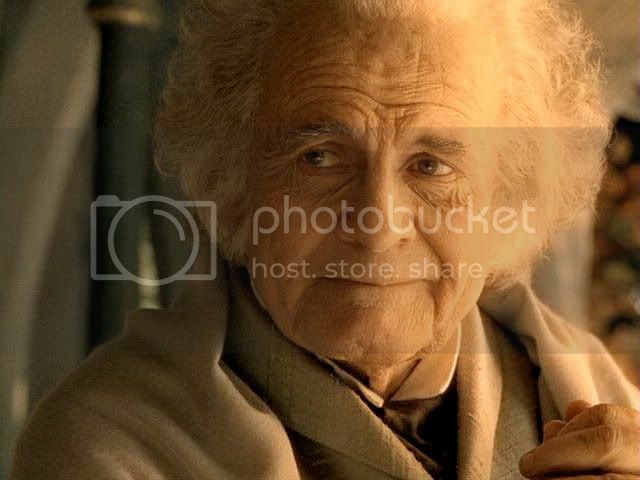 Bilbo to Frodo: I am getting very old, and I began to wonder if I should ever live to see your chapters of your story. I always thought that in this line and the line at the end of the book where Sam says to Frodo about the Red Book, "Why, you have nearly finished it, Mr. 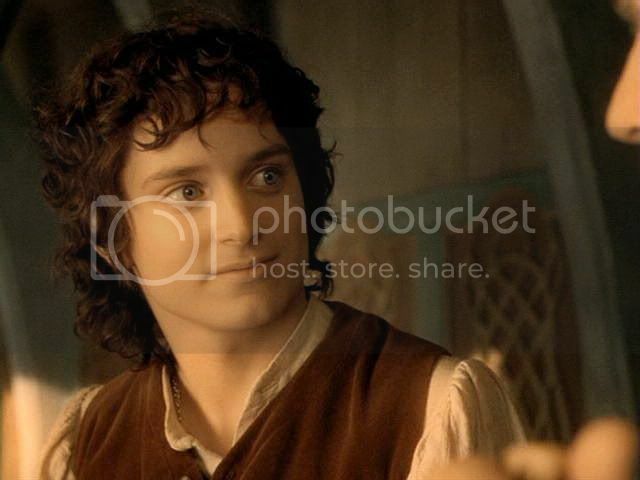 Frodo!" and Frodo replies, "I have quite finished, Sam...The last pages are for you" were really talking not only about pages in a book, but the chapters of a life. Bilbo was saying he didn't know if he'd get to see Frodo's life, and Frodo was telling Sam that he still had life to live. That has nothing to do with your post, but it was just something I thought of while reading. 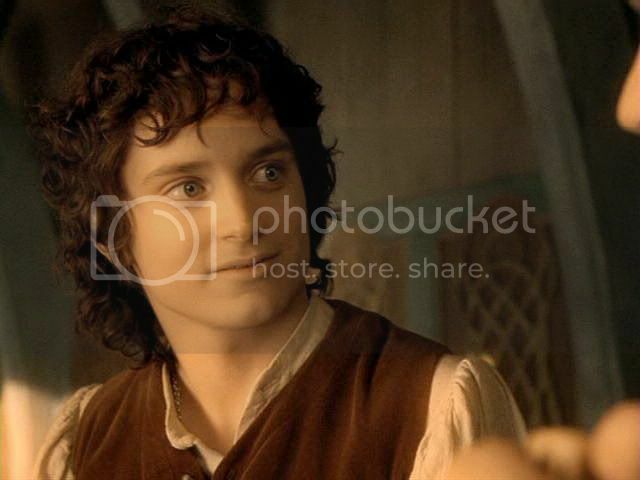 I have seen quite a few fanfic stories about the relationship between Frodo and Bilbo, actually. It seems to be a favorite topic. I like your observation that they almost seemed like old friends more than father/son or mentor/mentee. They certainly had a great fondness for one another. I love the "my dear boy" scene from the movie. Yes, I am sure you are right about "chapters" or "pages" in the book -- that they were meant to be understood as chapters or pages in their lives. But that goes with the "Great Tale" into which *all* their lives fit, the tale into which they came, but also exited. I love the way Tolkien's theme of narrative -- in stories, in lives, and even in the breadth of human history -- are all related to each other. Smaller stories fit into larger stories, and on and on, sort of like those Russian dolls that fit one inside the other. I've no doubt that it is, Primula. :) I suppose I should have made clearer that if my sense of the story has been skewed in the years since I've been reading fanfic, it's not because there isn't every sort of story out there, it's because I've [mostly] been reading in one genre, a genre that doesn't normally give Frodo's relationship with Bilbo much attention.